I sometimes feel the need for a small project. Something that I can finish quickly and easily. I needed some new coasters for my mugs and glasses so this was the perfect project. 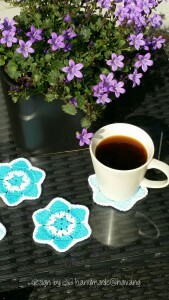 A combination of turquoise and white gave a nice summer feeling to the coasters. I chose Drops Loves You 7 in white, light turquoise and turquoise. This is the first pattern I publish in English so I´m really nervous! Here it goes! This is a free pattern for personal use only. 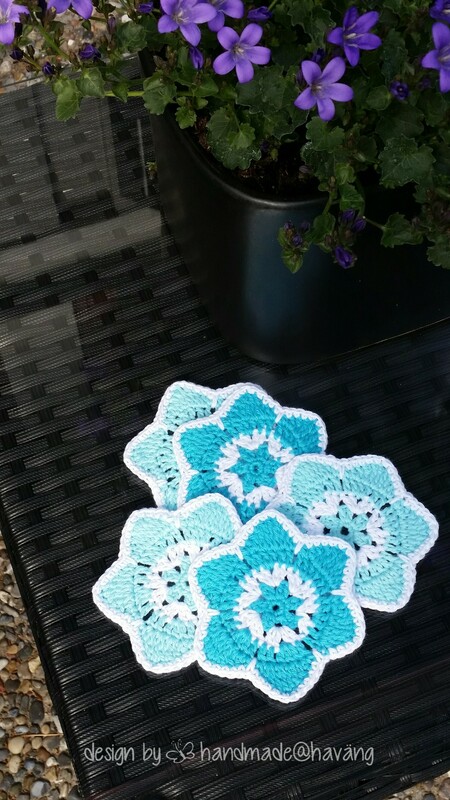 If you post a picture on social media of an item you have made using my pattern I want you to give credit to www.handmadeathavang.se or leave a link to the pattern. If you find any errors in the pattern, please, let me know. I would love to see your work so please tag images with #handmadeathavang. Yarn: Drops loves you 7 (white, light turquoise (number 19) and turquoise (number 18). This pattern is written in British English terms. First tr in a round is made of 3 chains. First dc in a round is made of 1 chain. Round 1: Work 6 dc in a magic ring, 1 sl st in first dc. Round 2: Work *2 tr in first/next dc, 1 ch*. Repeat *-* 5 times. Sl st i third ch. Change colour. Round 3: Sl st to ch-space. Work * 2 tr, 1 ch, 2 tr in ch-space*. Repeat 5 times. Sl st in third chain. Change colour. Round 4: Work *1 tr in the first/next 2 tr, 2 tr in ch-space, 1 tr in the next 2 tr, 1 ch*. Repeat 5 times. Sl st in third ch. Round 6: *1 dc in the first/next 10 stitches, 1 dc in the ch-space from round 4*. [Don´t hold the yarn too tight.] Repeat *-* five times. Sl st in first ch. 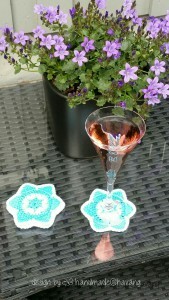 Weave in the ends and your coaster is finished!